In downtown, there is a free parking deck available on the west side of Churton Street, at the intersection of Churton and Nash & Kollack Streets to the right just beyond Weaver Street Market. There are also small public lots and on-street parking is available. Just look for the blue and white public parking signs. Please pay attention to parking space time limits. Parking in West Hillsborough is available across from Hillsborough BBQ in the large gravel lot. Parking throughout the rest of town is generally available near the entrance of storefronts in adjacent surface lots. This site has many listings for dining, shopping, historical sites, outdoor activities, and much more. 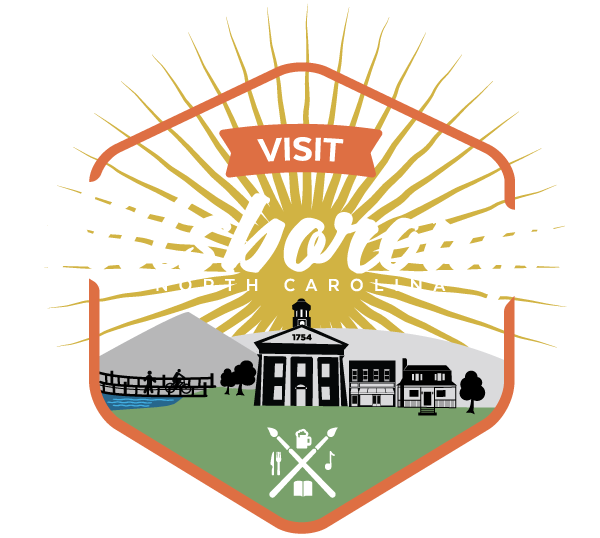 If you’re overwhelmed and need some guidance then just stop into the Hillsborough Visitors Center, located inside the c.1790 Alexander Dickson House, at 150 E. King Street Hillsborough, NC right near the Post Office. Our friendly staff would be happy to help give you advice on what to see and where to eat based on their experiences. The Hillsborough downtown is where unique shops, art galleries, and boutiques are located. Don’t let the picturesque setting fool you into thinking that you can’t afford anything. Many of the shops have both high-end as well as affordable gifts, jewelry, art, and accessories. Hillsborough is widely known for its unique, friendly shops that can’t be found anywhere else. Additionally, we have some of America’s favorite national retailers, mostly located at the Hampton Pointe Shopping Center at Hwy 86 and I-85 exit 164. These include big box stores such as Walmart, Home Depot, and Advanced Auto Parts. The Shops at Daniel Boone, with the famous giant fiberglass statue of Daniel Boone, will welcome you into a world of yesteryear with an amazing selection of shabby chic, vintage, and antique home goods, decor, toys, and collectibles. Can I tour the old buildings? Many historic buildings are historic sites open to the public, including the Alexander Dickson House (Visitors Center), the Orange County Historical Museum, the Burwell School Historic Site, the Ruffin-Roulhac House (Town Hall), and the Ayr Mount Historic Site. Additionally, many of the old Town cemeteries are open and the public is free to walk through them. Currently there are no private homes open and available for tours, however you are welcome to stroll the tree lined streets and admire these homes from afar.